Home Dining The Best Supermarkets in Astoria! The Best Supermarkets in Astoria! Grocery shopping can either be really fun, or feel like a huge chore – but it’s something literally every person has to do. Astoria has no shortage of supermarkets and grocery stores, and it’s not something you really think about too often. We’ve picked our top five choices! Trade Fair is a good place to start for the basics. They’ve got a huge variety of the basics, aka you can get all your milk, cereal, and eggs -but the thing we love most is that they have a really great variety of authentic choices from other countries. Trade Fair has a big selection of Halal meats which cater to the Muslims in the area, but they also have authetnic Brazilian, Asian and Spanish/Latin choices. It’s a good place to go if you want to find something from home. The only thing lacking here is that the produce isn’t always the freshest – but there’s plenty of green markets to choose from for those. Trade Fair also seems to have the most affordable prices across the board. Also, open 24 hours! And you might want to visit later in the night because it can be packed. Another one that seems to sometimes be lacking in great produce, but makes up for it in other ways. Berry Fresh has one of the best choices for gluten free foods – so if you’re gluten sensitive or have Celiac, it’s a great place to start your weekly or monthly shopping trip. They also have multiples aisles with international foods – but slightly pricier than Trade Fair. You get what you pay for, though, and the choices are definitely a step up. Berry Fresh is really conveniently located, though, if you’re around the Ditmars area – it’s also surrounded by a lot more stores, so if you have a dedicated “shopping and errands” day, it really helps. There’s a great variety of seafood here as well. If you’re looking for full fledged international, Euro Market seriously can not be beat. Here’s what Euro Market does amazingly: meat, cheese and beer. And anything European, obviously. It’s one of those places where you just want to go inside and try everything – and it usually turns out awesome. Definitely stop by the deli counter and tried their smoked meats – it’s a completely different world of flavor. If you’re unsure of what to get, the staff here is always helpful, and will usually let you try a little of any meat before you buy it! Also, let’s talk olive oil. Nobody does olive oil like the Greeks, so you know this is the place to get authentic, amazing, oil. Bravo is probably most comparable to Trade Fair – they have generally equal products and prices, and a similar way of arranging the supermarket by country, rather than by type of food (which can sometimes get confusing). They have a really great fish selection, and compared to Trade Fair, their produce is generally much fresher and more appealing. They also tend to be less packed. Plus, they’ve got an ENTIRE aisle of beer. How awesome is that. Astoria, we are seriously lacking a Trader Joe’s, but Greenbay aaaaalmost makes it alright. If you’re looking for healthy, organic options, Greenbay is definitely the first place we recommend. They have a cooked food bar which is good for lunch, but it’s easy to pack on the price here. Their options are a little on the pricey side, but that’s what you expect to pay for more organic food. 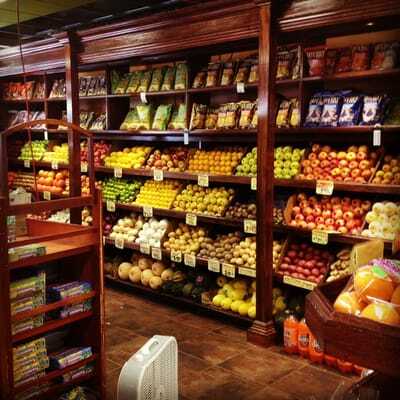 They’ve also got probably the best selection of fresh fruits and vegetables in Astoria. Overall, the best place to go for organic alternatives! Did we miss YOUR favorite supermarket? Drop a comment and let us know! Previous articleGetting our drink on at Blackbird’s! Next article60 Beans is here!